Map of West Edan for Elex. Missions, NPCs, Quests, Teleporters, Trainers, Traders, Monsters, Items, Secrets, Hints, Locations ELEX Walkthrough, ELEX Maps, ELEX Guide & Wiki. 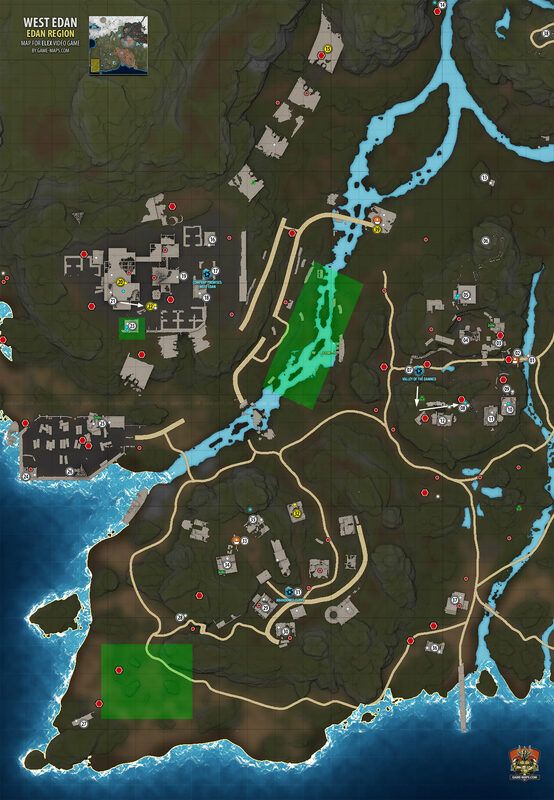 West Edan Map for Elex. In general, almost all of Edan West is hostile. Exile - this is trap. After short dialogue they will attack you. "Golden Whisper next 12 point, on the top"
As my mission proves, Albs area threat even here in Edan. There is something behind all of this. A secret between the lines. These clues must lead somewhere. 21 Descent to underground levels. Go down few levels to basement. 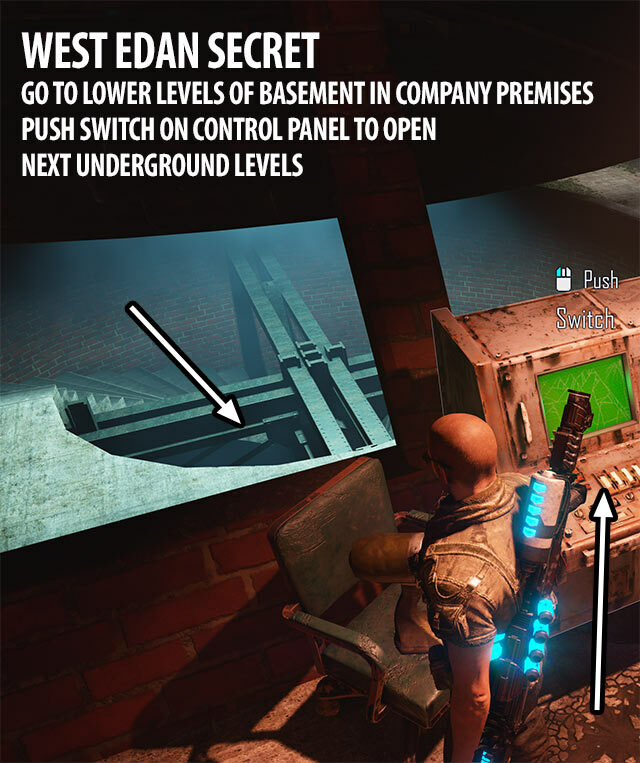 Switch - use it to open next underground levels. It should be possible to find a type X48 reactor coil in a hidden Old World Science lab in Edan. "Sailor's log just north of #26 between 2nd and 3rd crates"
Thorald- it will not be friendly to you until you have a task associated with him. Go away and do not take Mana lying around. Classic Sunglasses - Temporarily makes livings things easier to see. Do not return to Hakon in Goliet until you finish all things with Nezol and finish [Clearing the Forest]. I spoke to an Alb Separatist called Nezol. He wants to broker a peace agreement with the Berserkers. After you finish talk with Separatists, return to Hakon in Goliet for [The Negotiator] and [Searching for Clues]. The Berserker Hakon had the Separatists in Edan killed instead of making a deal with them. I should find out why.